Not surprisingly, my 4-year-old just looked at her, dumbfounded. She has no idea that POV means point of view or why a young child (or anyone) would need this. The genesis of this conversation is (a bit embarrassingly) The Next Food Network Star that my older daughter and I watched over the holiday on Netflix. If you aren’t familiar with this Food Network show, each contestant needs to identify his or her point of view and infuse it in everything he or she does. For instance, the season we watched had Lenny, the “gourmet cowboy,” rise to glory through many challenges that included describing food, going on live television, creating culinary experiences, and more. I like that my 8-year-old is already thinking about how she is going to differentiate herself in whatever it is she decides to do (even if it’s not becoming a chef, which is her current ambition). We as marketers need to be doing this as well – regardless of what role we play. 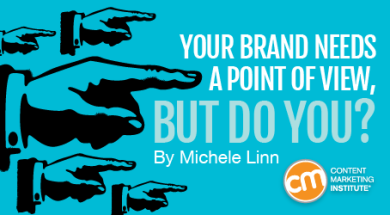 It’s not just something that brands or consultants need to do. It’s something that you – yes, you, dear marketer who works for a brand – need to do if you want to stand out in the sea of other marketers. The other day I had a recruiter call me and say, ‘We want you to lead our digital department.’ I said, ‘Tell me more.’ They said, ‘It includes PPC and SEM and design and …’ Instead of spending time considering, I was able to quickly respond, ‘I’m really honored.’ I didn’t even ask how much it paid or anything. Instead I realized it has nothing to do with what I actually want to do. A related theme also surfaced at Content Marketing World: If you want to be hired for a content marketing job – or advance in your career – there is no better way than to choose a project/passion, communicate about it via a blog, podcast, a video series, etc., and build your audience. People who seek awesome content marketing talent have told me they want people who are putting something together around their personal passions. Prospective employers recognize that people who publish content about a topic of personal interest and share their knowledge likely can apply that knowledge and tenacity to their brand. Since these conversations, I have been thinking a lot about my point of view. What am I passionate about, what do I want my career to look like – and am I fulfilling it in my current job? As I briefly wrote in our most recent CMI team SlideShare, if I could have any job, it would be helping people (specifically other moms) reinvent their careers and find the jobs (and lives) they want to live. At first, this may not seem like something I am doing now as the vice president of content for CMI, but the more I thought about it, this is something I do every single day. While there are many things I adore about CMI, the most gratifying feedback we receive from marketers is when they tell us that we are helping them find the career they want. It could be by giving them a way to describe what they have been doing for years or by giving them the skills to improve what they are doing so they can get the job they want. It’s even by helping them find their “people” who understand what they do so they can figure out challenges together. Instead of considering my vision as something I want to do “someday,” I have started to make small changes in what I write and how I present myself online. 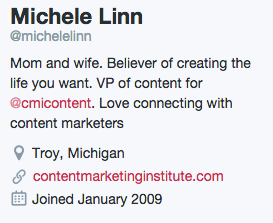 Here are examples of the updates I made to my Twitter bio and LinkedIn profile. It’s an evolution, certainly, but it’s nice to have a guiding light for my personal brand. There are many examples of small brands – and solopreneuers – who have a distinctive point of view. Joe describes this critical step as your content tilt. For instance, I love the example of Ann Reardon, the food scientist and baker who creates seemingly impossible creations such as a cake that looks like the Instagram logo. Or MatPat, the YouTube celebrity who has a channel called The Game Theorists. However, I know many of you marketers who are working for brands may not think these individuals’ perspectives are relevant to your circumstance. Here are a few examples from your “people” who have a strong point of view that is integrated into the work they do for their brand. 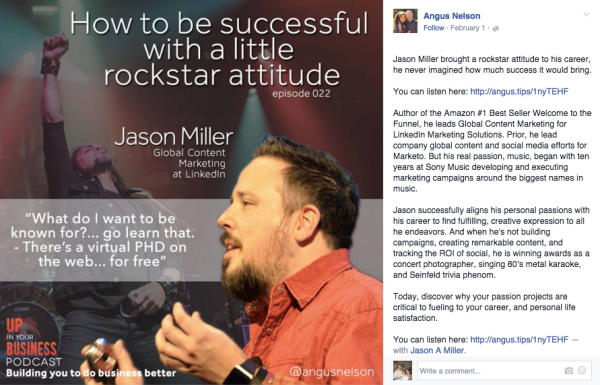 LinkedIn’s Jason Miller has a POV around a topic seemingly unrelated to marketing, but it is part of everything he does – rock ‘n’ roll. I have also really enjoyed watching Andrea Fryrear, who works for SurveyGizmo and MarketerGizmo, develop her personal brand that closely aligns with her marketing passion: Agile marketing. I learned about Andrea’s passion for Agile last year at the Intelligent Content Conference. 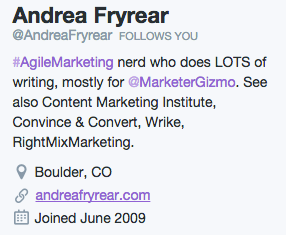 In short, she now is my go-to person for Agile marketing (with both writing and speaking) – and, as you can see in her Twitter bio, she writes for other digital publications as well. 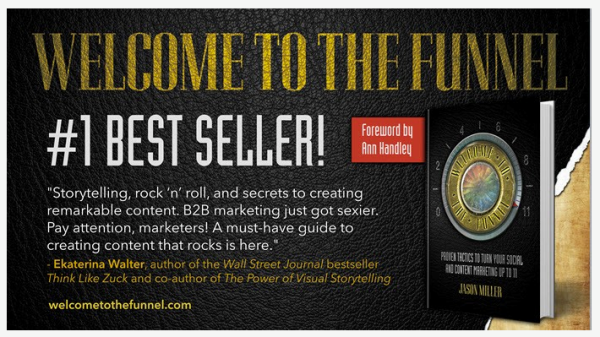 She consistently identifies herself with Agile marketing. A lot of people want to build their own brand but very few people actually do it because it takes a lot of work. You have to be very passionate about it. If your point of view isn’t evident, consider these steps that Minda Zetlin describes in a recent article on Inc., 9 Surprising Ways Just Being Yourself Can Make You Remarkably Successful. Having a point of view is relatively simple – and necessary. My 8-year-old is thinking about this. How are you going to apply this to your life? 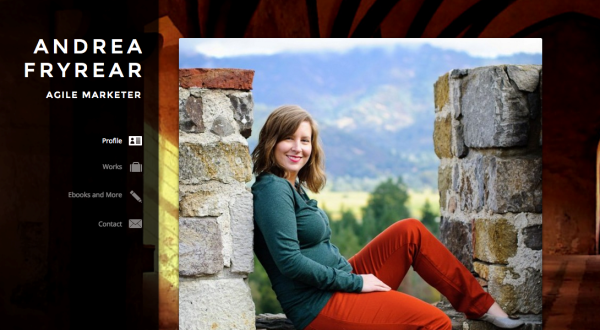 Want to learn more about how Andrea Fryrear has developed and implemented her personal brand? Chat with her at the Intelligent Content Conference this March. Use code BLOG100 to save $100 off of the main event and all-access passes.